266th day of the year. There were then 99 days left in 2018.
on the 39th week of 2018 (using US standard week number calculation). 2nd day of Fall. There were 89 days left till Winter. September 23, 2018 was the 1st day of Sukkot (Jewish Observance). 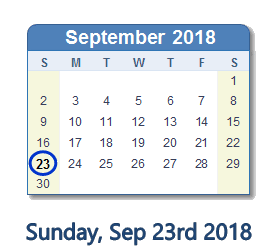 What happened on September 23rd 2018?